I tested my new Esties today- one blue with a lovely 9460 manifold nib that is slightly stubbish – and one pearl grey with a real good 9556 nib that is a rather smooth fine on the verge to an extra fine (by western standards. Since I had my camera with me (surprise!) I took a few snapshots of them in action. 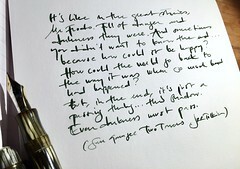 They got to work rather hard together with the faithful servant Lamy Vista – as ever filled with Diamine Sunflower Yellow (or Rohrer and Klingner Helianthus). 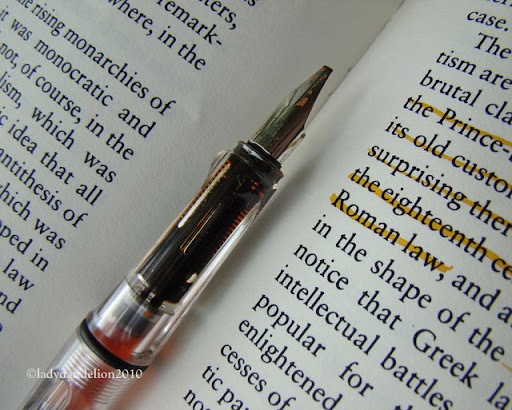 The Lamy Vista with a 1.9 mm italic nib loaded with this sunny ink is the best highlighter I have ever used – it cheers me up in a way that no felt tipped highlighters have ever done. And the colour doesn’t stand out from the page in a blinding way. I also like the look of the deep yellow (with reddish hues) in the feeder of the Vista – cool and smart. 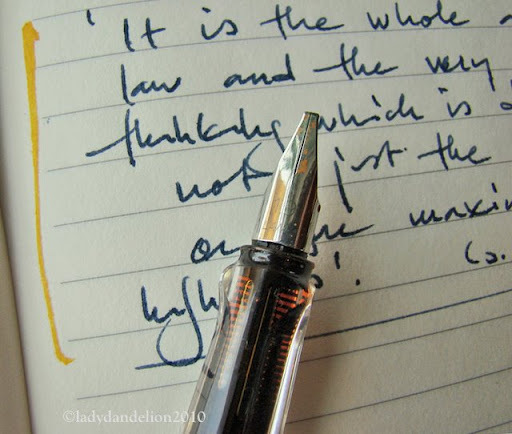 And, if I want to change the colour or use it as a calligraphy pen – I just do it! I can also change the nib if I like – I have some spares. 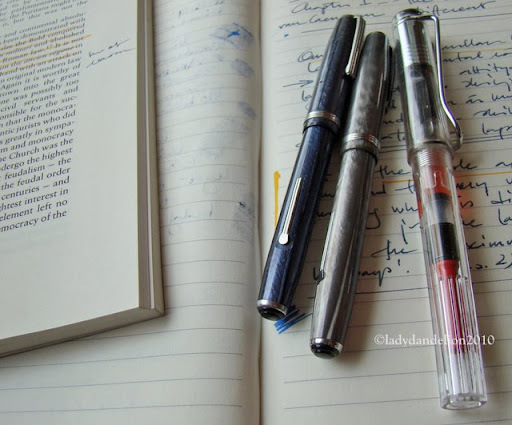 When I think of which pens I have in rotation I often forget the Vista – it is always there and fulfil its various tasks – which is very unfair – it is the pen I use most and it never fails me. 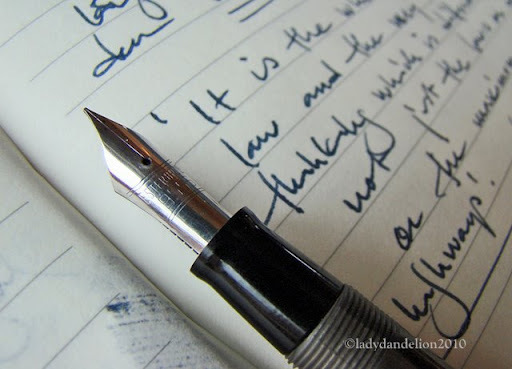 It is one of the pens that gives absolutely most bang for the buck and I warmly recommend it as an unfailing, sturdy and cool all-purpose fountain pen. If you buy it on eBay it can be had for very low prices from some (often UK-based) dealers. After this praise of my too-often-overlooked Vista I’ll return to the trial of the new (for me) Esties. The Blue Estie was filled with Diamine Royal Blue and the Grey filled with my own homebrew which is a mix of Diamine and Pelikan blues and blacks and works really good and is rather water resistant. Testing new pens during a work day – meaning hours of reading and writing, since I am studying and finishing a paper – is a rather fool proof way of getting to know a pen’s pros and cons. The big pro with both is the nibs. Both are good, but the excellent writing quality of the 9460 was a surprise – smooth, slightly stubbish – it is a real pleasure to put this nib to the paper. The 9556 is very good being a fine-extra fine. No dryness or scratchiness – an even and medium wet line that makes it a very good pen for note taking. The 9460 is (for me, that is) a little to thick for margin notes and note scribbling, but suits very well for journalling and letter writing. The big con is the size. These two are Esterbrook SJs, which means that they are shorter and more slender than the regular J pens. The good part of it is that they fit the loops on my Filofax. The bad part is that I find them too slender for more extensive writing. Another small drawback is that you can’t check the ink level since they are lever fillers. But they fill well and easy. But, considered that these can be had for very low prices I’d recommend them any day. I’ll probably have at least one of the Esterbrooks inked and in my regular work force/standard pen in my filofax, but neither will be on the short list for longer writing sessions because of the slenderness that makes my hand very tired. But in all – they are, just like the Vista, extremely price worthy. 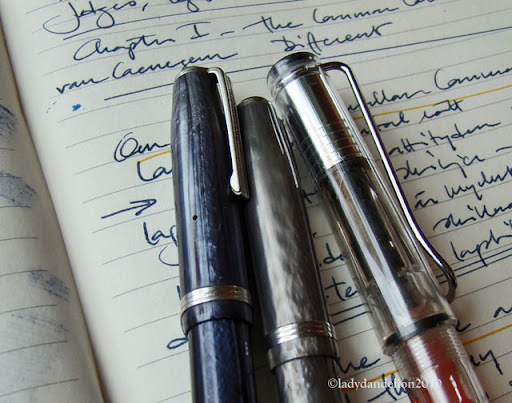 These three pens are three good, affordable, no-nonsense everyday workhorse pens. I like that. This entry was posted in diamine, esterbrook, fountain pens, inks, lamy, pens, photo, writing and tagged diamine, esterbrook, filofax, fountain pens, ink, lamy, Pelikan, pens, photo, rohrer & klingner, writing. Bookmark the permalink.